Who doesn’t love a good breakfast casserole?! I wish I was joking when I say after I made this, I ate half of the pan….half.It is SO unbelievably good you guys, I can’t even express it in words. All I can say is make it and you will understand. This is a great recipe to make ahead of time and the pop it in the oven when you’re ready to eat. Perfect for a savory brunch. It’s light and fluffy but packed with flavor. Ok, the first thing you want to do is preheat your oven to 350 degrees F. In a greased baking pan add your diced french bread and set aside. In a pan over medium high heat add your butter, onions, mushrooms, and a pinch of salt and pepper. You want to make sure that you don’t use too small of a pan because if you crowd your mushrooms too much they won’t brown and we want them browned! 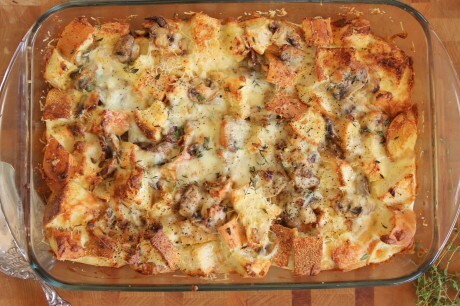 Once your mushrooms are browned add them in a layer to the bread. In another bowl whisk together the milk, eggs, thyme, mustard powder, nutmeg, salt, and pepper. Whisk until everything is blended and then pour over the bread. With your spatula push the bread down into the liquid so everything is coated. Add the grated cheese to the top and put it in the oven. Let it bake for 25 minutes until nice and slightly browned on the top. Let the casserole cool a few minutes before serving to your guests, alongside a mimosa or bloody mary of course. Seriously, try this. Enjoy!